My food waste this week isn’t completely barren but it’s not an epic fail either. I have; 2 tiny pumpkins (see next week how I used up a lot more of my former Thanksgiving centrepiece), 1 very gross tomato that just seemed to ‘give up’ on the kitchen counter overnight, 1 portion of soup that I’d packed for the husband’s lunch and…we both forgot about it. Onto better things now though. My accidental series on the multitude of uses of my waffle iron continues today with a great breakfast. Tomorrow when you are just about to head out to do all of those errands, fuel-up with this treat. Or even better, do the last of your shopping online and have an extra cup of coffee. 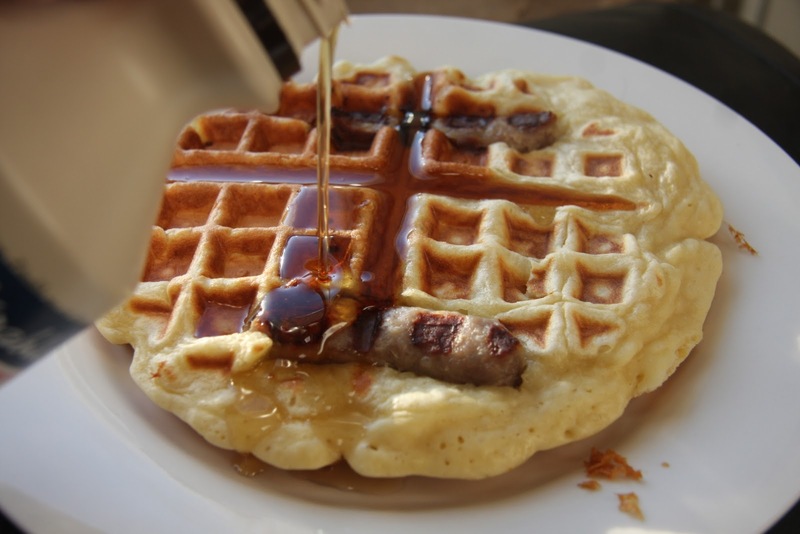 Now you can just as easily use a waffle mix but I never seem to remember to put that on my list and when this recipe is so easy I don’t mind whipping it up on even the laziest of days. Simple take 1 3/4 cup of flour, 2 tsp. 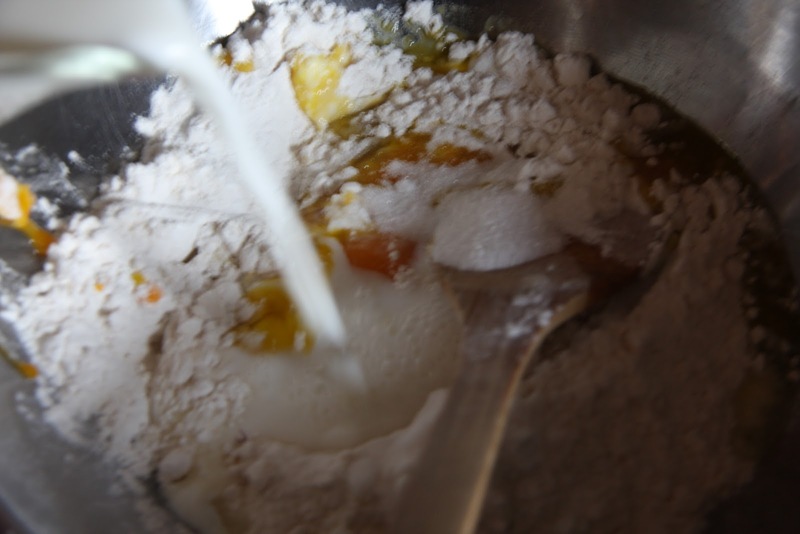 baking powder, 2 eggs and 1 cup of milk. Mix, mix, mix. 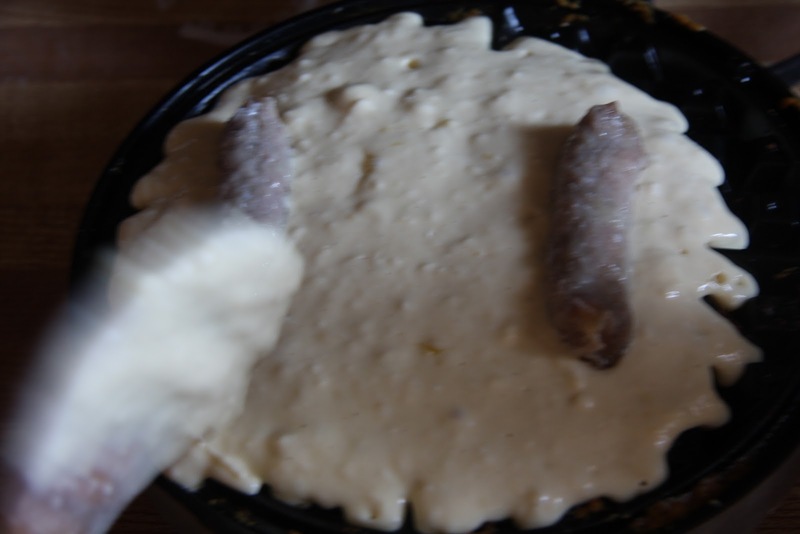 To your preheated waffle iron add 1/2 cup of batter and then layer on 2 breakfast sausages. Once the sausages are brown (I turn the heat down on my iron so that the waffles don’t burn before the sausages are cooked), slather with as much maple syrup as you can get away with. After not using my waffle iron for years and years, I gave it away recently. Now you're tempting me with all of these uses. Oh, well. Thanks for sharing! Great idea to throw in the sausages. Very cute! I had the most amazing waffle lunch in Traverse City that features local food: a fresh buttermilk waffle, extra crunchy, topped with shredded, braised chicken, fresh wilted spinach and a light white sauce. Great, great lunch. I have a bad case of waffle fevah, and I don't want to be cured!